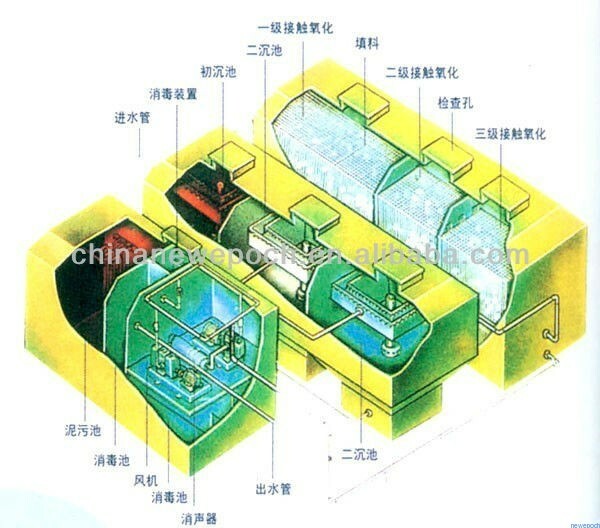 Buried Type Contact Oxidation Process Sewage Treatment Equipment-Jiangsu new era of environmental protection Ltd. The equipment can reduce SS, turbidity, BOD5, COD, chromaticity, O&G, total coliform etc by 3 grades bio-chemical process. The whole process is based on the core technology-contact oxidation reaction and include primary sedimentation, anaerobic, aerobic, second sedimentation, sludge reflux nitrification, disinfection etc. First, raw sewage will be gathered in a collecting tank. Then sewage will be pumped into adjusting tank for aeration through a screen. After aeration, the sewage will be lifted into contact oxidation tank, which is the main part of the system. The contact oxidation tank will be fixed with packing material as the nests for microbe. The aerobe will take the organic pollutant as its nutrient source and growing rapidly. In this period, organism will be decomposed, digested. Nitrogen, phosphorus, BOD5 will be decreased. After grades of contact oxidation reaction, water will flow into sedimentation tank. Supernatant will flow into clean water tank for disinfection and discharging. The sludge at the bottom will be pumped into sludge tank. The sludge will be concentrated for further treatment and supernatant will reflux to water collection tank. Integrative equipment includes primary lifting pump, sewage treatment (triple bio-treatment), sludge reflux pump, sewage second lifting pump, aeration air blower, automatic back flush sand filter, sewage reuse inverter-controlled pump, PLC control equipment etc.